PER NØRGÅRD (b.1932): Drømmesange*, Singe die Gärten, mein Herz*, HELMUT LACHENMANN (b.1935): Consolation II (Wessobrunner Gebet), ALFRED JANSON (b.1937): Nocturne*, KAIJA SAARIAHO (b.1952): Überzeugung*, Nuits, adieux, IANNIS XENAKIS (1922-2001): Nuits. * - w/members of the Oslo Sinfonietta. 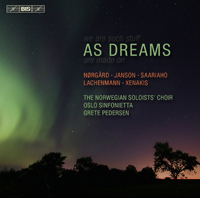 Description: A wide variety of modern choral and choral-orchestral music covering the broad stylistic gulf between Janson’s neo-romanticism, Nørgård’s more modern but still quite approachable pair (ditto for Saariaho) to the hyper avant-gardism of Lachenmann’s fragmented speech-sounds and Xenakis’ landscape of strange sounds and fragments of Sumerian and Assyrian provides a stage for the brilliant virtuosity of this Norwegian choir. Norwegian, German, French-English texts. Norwegian Soloists’ Choir, Oslo Sinfonietta*; Grete Pedersen.